Cheick Tiote has now been ruled out of the match which stretches Newcastle’s squad even further. “He(Tiote) won’t play on Monday night but he’s a lot better and he’s got a good chance for Norwich we think. You’re talking about one of the top Premier League players in my opinion but we have a lot of good players still haven’t been seen at this football club yet”. This week we’ve been told how Vurnon Anita is more than happy filling in at right-back but it is intriguing/amusing to see the manager’s claims of ‘…good players still haven’t seen’! Players who haven’t been seen would make you think of young untried players and Everton away on a Monday night with a backdrop of animosity, isn’t likely to be the place for Alan Pardew to throw in inexperienced kids. What you would guess is most likely is that Alan Pardew will go for older heads in what is sure to be a difficult and likely physical encounter. Bigirimana looks to be a great prospect and did really well when coming on against Villa but to go up against Fellaini would be a big ask at this moment in time. I’m guessing we’ll already have Harper filling in for Krul, Anita at right-back, Williamson in for Coloccini, so who will be alongside Cabaye? My money will be on Jonas moving further inside in an attempt to try and stop Fellaini bossing the game which he is more than capable of. I could well see other unforced changes such as one of our strikers dropping to the bench to try and nullify Everton’s hard working game, or at the very least revert back to Demba Ba moving wide left. The likes of Marveaux and Obertan must come into the equation and they need to raise their games to show that they deserve a place in the team. The excellent spine of last season’s team is now taking a right battering, we’ll need backbone at Goodison Park but have we the back-up players to provide it? 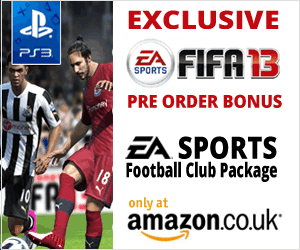 Exclusive Amazon offer on the new FIFA13, get your pre-order bonus now!